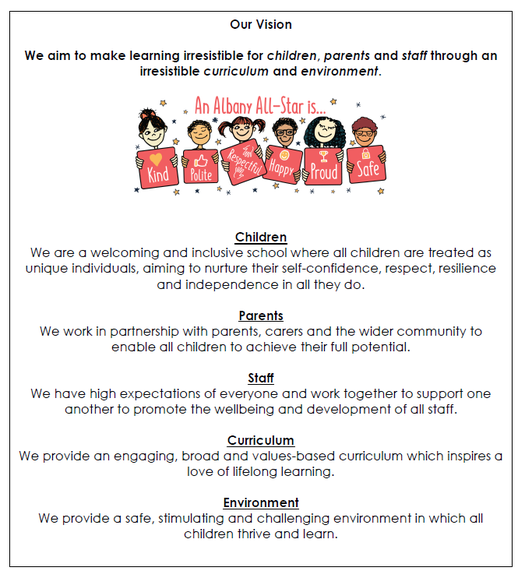 Our vision and values underpin everything that we do here at Albany Infant and Nursery School. Our vision is centred around ensuring that we make learning irresistible for our children, encouraging them to develop a love of learning through an irresistible curriculum and environment. Our school staff and parents are a key part of achieving this. In 2017, our school council and parent forum came up with the idea of the 'Albany All-Star.' This idea underpins our whole school ethos and sets out six key values that our children should demonstrate both inside and outside of school: kind, polite, respectful, happy, safe and proud. To us, it is equally important that our children leave our school with a secure knowledge of how to demonstrate these values as it is that they leave with a secure understanding of areas such as reading, writing and mathematics. We expect all members of our school community to demonstrate the six values, ensuring that our children have excellent role models in helping them to develop as Albany All-Stars.